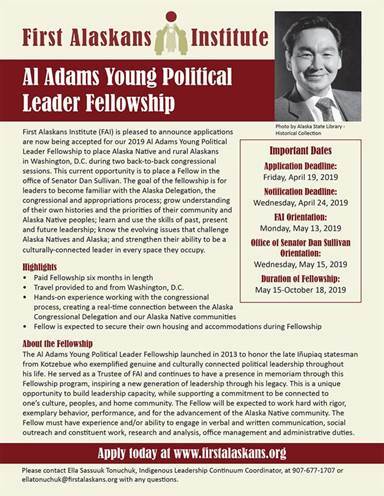 First Alaskans Institute (FAI) is pleased to announce applications are now being accepted for our 2019 Al Adams Young Political Leader Fellowship to place Alaska Native and rural Alaskans in Washington, D.C. during two back-to-back congressional sessions. This current opportunity is to place a Fellow in the office of Senator Dan Sullivan. To learn more visit here. To apply online visit here. · Fellow is expected to secure their own housing and accommodations during Fellowship. Please contact Ella Sassuuk Tonuchuk, Indigenous Leadership Continuum Coordinator, at 907-677-1707 or or ellatonuchuk@firstalaskans.org with any questions. The CIRI Foundation Education Resources handbook contains information from selecting a school to finding an internship. It also includes hundreds of scholarship opportunities across many disciplines- the focus is on Native students, so you do not need to be affiliated with CIRI to benefit from this book. The NCAI Wilma Mankiller Fellowship Program for Tribal Policy and Governance Fellowship Program provides an exceptional opportunity for emerging young professionals from across Indian Country to work side by side with national leaders in tribal policy. Applicants must have a college degree or equivalent experience. Timeline: Fellowship Applications will be accepted until 12:00 p.m. EST on March 31, 2019, with decisions made no later than April 30, 2019. This Fellowship program was established in 2011 to support the development of visual artists and the potential for inter-cultural dialog. Each year, the Foundation awards two residency fellowships to Native American visual artists at the Vermont Studio Center. Each Fellow receives a one-month residency, which includes room and board, a private studio, and a $500 travel stipend. Founded by artists in 1984, the Vermont Studio Center is the largest international artists’ and writers’ Residency Program in the United States, hosting 50 visual artists and writers each month from across the country and around the world. The Studio Center provides 4-12 week residencies on an historic 30 building campus along the Gihon River in Johnson, Vermont, a village in the heart of the northern Green Mountains. The annual application deadline is February 15. Artists must apply online. To find out more about this opportunity, please contact David Grozinsky at 802 635-2727 at the Vermont Studio Center or Susan Caraballo at Harpo Foundation. Click the link below to see fellowship opportunities for graduate students in marine sciences and policy! NIHB Health Policy Fellows are a diverse group of talented Native youth who are dedicated to making a difference in their communities. Fellows work directly with their Tribal leadership to identify one priority health issue. Then, with the support of program mentors, Fellows learn how to analyze policy in their issue area, create informed recommendations, and advocate for change. Applications are due March 30, 2019 by 11:59PM. Please contact, Dr. Wendee Gardner, NIHB’s Youth Engagement Manager at wgardner@nihb.org or 202-548-7297 if you have any questions or want to learn more.